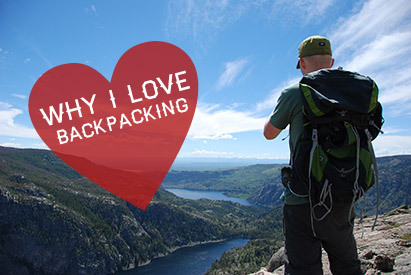 Why I Love Backpacking! | GearAtlas.com – The ultimate resource to compare Hiking, Backpacking & Camping Gear! With a backpack full of carefully selected gear on your back, your body is transformed into a self sufficient mobile reconnaissance vehicle. You have an unparalleled level of freedom to go virtually anywhere you want with the assurance that everything you need to survive and thrive is right there on your back. It’s an incredibly empowering feeling and there’s a beautiful simplicity to it. How is it that we can sit within the walls of our spacious homes that are filled with countless possessions inside and still wonder if we have everything we need; yet we can confidently step foot into the wild carrying only a backpack, knowing we have everything we need. It’s about stripping life down to the core essentials and leaving all the excess at home. In doing so, backpacking allows you to travel deep into the heart of nature to places that have never seen a car tire track and that most likely never will. If driving right up to a campsite and sitting around a fire ring is a satisfying morsel of food for the soul, going backpacking is an unadulterated feast. As the vehicle you drove to the trailhead becomes smaller and smaller in the distance, the natural world that encompasses you becomes larger and larger. It’s infinitely more fulfilling to backpack in to a campsite that’s fully immersed in nature than it is to settle for a campsite that is located mere feet from the road. I must warn you though, you’ll likely have neighbors either way. One type of neighbor has a tendency to run their gasoline powered generator into the wee hours of the morning, while the other type of neighbor blends right into nature, because that neighbor is part of nature. While camping in the incredible Uintah mountain range last year I was woken from a deep sleep by the sounds of coyotes celebrating their reign over the night with their hypnotizing calls and howls. It was an amazing experience and something that most humans will never experience. It was raw and so out of the ordinary. I’d be lying if I said I didn’t feel at least a bit vulnerable, and yet I never felt unsafe. I certainly felt alive. Just hours later, the soft light of dawn was starting to overpower the darkness of the night and I was woken once again, this time by the powerful and almost kingly snorts of a buck that was establishing his throne in the forest. I couldn’t see him through the walls of my tent, and yet I felt like I knew more about this buck than I ever could have learned by watching nature documentaries or flipping through books and magazines. Nature was meant to be experienced first hand and backpacking puts you into the types of situations that experiences are born out of. These are the kind of experiences that really matter and that endure the test of time and memory. I may not be able to tell you what I did just a few weekends ago, and yet I could tell you exactly what I did and how I felt when I went backpacking – whether it was days or years ago. These are the stories I’ll share with my friends and my loved ones. These are the stories I’ll joyfully relive whenever I feel the persuasive hands of society trying to tame this wild heart. This is why I love backpacking. This entry was posted in Blog, The Outdoors. Bookmark the permalink.